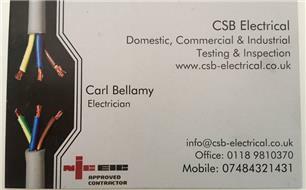 CSB Electrical - Electrician based in Baughurst, Hampshire. Invoice history based on 21 reviews. Welcome to CSB Electrical Checkatrade page. We are a NICEIC approved electrical contractor, which means our work is performed to a very high standard. We have experience across all sectors, including Domestic installation, Commercial fit outs and industrial projects. We also preform electrical test and inspection in all sectors mentioned. All our quotes are completely free so please feel free to call or send an email regarding any projects you are planning, small or big.